Well after a chat with my boyfriend, I’ve actually decided to blog daily instead of weekly. I just feel that if I blog weekly, there’s loads of chances for me to deviate from the track, whereas if I’m blogging every day, it keeps me accountable. I think blogging on a night before bed will be better than morning, cos I have been known to stay in bed quite late on weekends, and I’d probably forget! 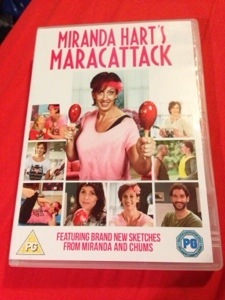 I’ve just finished my first attempt at Miranda Hart’s Maracattack. On the DVD, there’s a 5 minute warm up, 20 minute cardio session, 5 minute high intensity session and 10 minutes each for arms, core and legs & bums. I did all of it except the high intensity section, since it involved a lot of jumping, and my room is in a creaky attic above the bedroom of my sleeping dad! At first I thought I was going to hate it because I couldn’t keep up with the moves in the cardio section, but I think that’s probably because it was the first time I’d done it and I didn’t know what was coming next. I thought the legs and bum section was bad with all the squats and lunges, but the core section was killer! I had to take a breather halfway through the crunches, when I didn’t think I’d be able to keep my legs in the air any longer! All in all though, it was a good workout. I’ll carry on with it this week and see if I get any more coordinated at the cardio section!